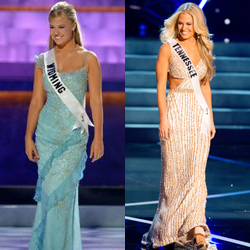 This page details the Miss Wyoming Teen USA titleholders who have competed at Miss USA or competed in Miss USA state pageants. Click here for a full listing of Miss WY USA & Teen USA titleholders. Five Miss Wyoming Teen USA titleholders have competed at Miss USA. The first two were Katie Rudoff (99) and Kristin George (00) who held consecutive Teen titles and were the final two at Miss Wyoming USA 2004. In 2012 Brenna Mader (05) became the first Wyoming teen to win another state when she won Miss Tennessee USA 2013.